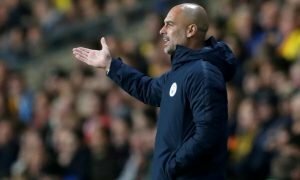 Man City star sees contract talks delayed after fierce row | The Transfer Tavern | Where football transfer rumours fly or die! Our resident Manchester City fans who were enjoying a pint after their 4-0 win over Crystal Palace have been alarmed by an article in The Daily Mirror which claims that the Blues have put contract talks with Kelechi Iheanacho on hold. The report comes after an alleged row with regards to who actually represents the Nigerian striker. 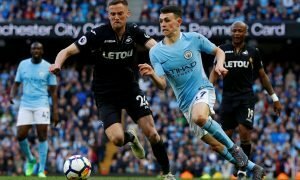 The 19-year old is expected to be rewarded for his breakthrough season with an improved deal, although the word around the Tavern is that City have had to delay to negotiations over a major pay rise due to the fact that there is a battle between two rival agencies. American firm First Eleven Management have represented Iheanacho since he was a schoolboy and advised him to move to the Etihad back in January 2014. They claim that he signed a new agreement when he turned 18. However, London-based Stellar Group are now claiming to be Iheanacho’s new advisers. It is reported that the issue has been raised with the FA and that an arbitration hearing will be scheduled, while the word in Africa indicates that the problem is likely to be decided in court. Iheanacho has impressed even the neutral fans in the Tavern this season, having made 4 starts and 11 substitute appearances for Manuel Pellegrini’s men this season, scoring 5 goals in the process. He is regarded as one of the most promising youngsters to have come from Africa and was recently named in TMW’s list of 100 great young talents, whilst Pellegrini cited the Nigerian to be a ‘very important player’ with a ‘bright future’ at the club. Our landlord believes that Iheanacho’s contract situation will be resolved and that he will be a great player in the future for City. Manchester City fans, do you think that Iheanacho will be your first choice striker in the coming years? Let us know in the comments below!